In high school, my favorite art class assignment was to create a drawing utilizing various elements of a chosen subject or object. I had an image in my mind`s eye that I wanted to translate onto paper. The image was the Earth, encased in a faceted crystal ball, being observed. I chose a microscope to convey observation. I had a vague sense, and then a strong compulsion to portray the microscope as protruding from a nebula. I spent hours pouring over coffee table books searching for the image I was `seeing`in my mind`s eye (this was back in the 7O`s, before computers were accessible}. When I finally discovered the nebula, I was excited to discover that the shape of the nebula provided the perfect segue for the Microscope head and lens to emerged from the white part of the nebulae. I felt colorful light prisms also needed to be part of the creation. I had no idea what patterns a crystal ball would create, so I suspended a real, faceted crystal ball inside a box lined in white paper. Then, using a penlight, I directed light through the crystal ball to create the rainbow light patterns I was seeking. I was thrilled with the finished drawing as I had captured exactly what I wanted to convey. Unfortunately, in my true past codependent style, I gave the drawing away to a boyfriend, and the original artwork is long gone. Recently the image resurfaced in my consciousness. The experience was similar to someone knocking at your door, or tapping you on your shoulder trying to get your attention. Having exhausted all attempts to obtain the drawing, I instead began to ponder the image that was so strongly in my mind`s eye at 16 years old. Looking back, it is clear to me now that, often our visions for creation are actually clairvoyance, meaning clear vision, pertaining to the ability to gain information through extra sensory perception, (beyond ordinary sensory perception). The creation process also is a wonderful example of multidimensionality, exploring and viewing and operating in our lives from many different angles, dimensions, and vantage points (or perceptions) existing all at the same time. 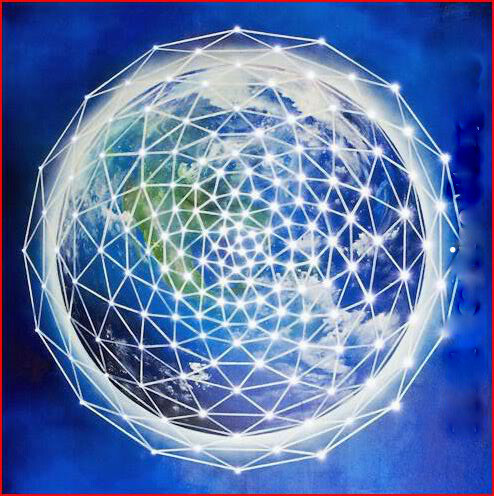 The faceted crystal ball pattern is now commonly recognized as the crystalline grid around the planet. Of course I had never heard of anything of the sort back then. It is particularly interesting for me to note that I have always felt observed, like a science project,(and I don`t mean, observed by people I could see). The use of a microscope was very intentional, as it felt like data collecting observation, not just voyeurism. These days, anyone on the path of Ascension is well aware of the fact that we, on planet Earth, are in the Galactic spotlight. How we are navigating Ascending while in physical form, how we are waking up from our unconsciousness, dealing with shifting out of duality through Conscious choice and frequency modulation (vibrational alignment by Consciously choosing our thoughts/words/deeds and emotions}, and discovering how we are liberating ourselves from the oppression of Limitation Programming in order to open to our full potential and reclaim our power, is of great interest to our Galactic Families. I finally occurred to me to find out the name of the nebula. For some reason I didn`t record it, or even note it. 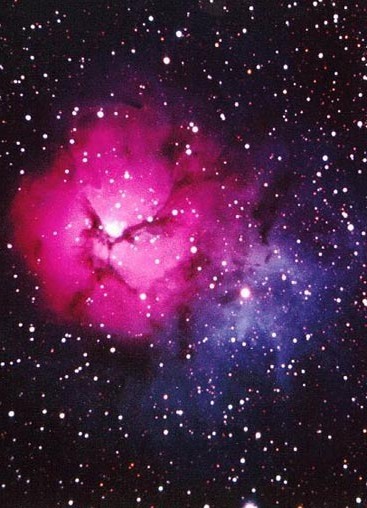 The name of the nebula I chose is “The Trifid Nebula”. It means, split into three lobes. I liken this to the Sacred Trine and Cycle of, Birth-Life-Death, except now, Death = Ascension. A site i found referencing the symbolic meaning of this nebula shared, “the Trifid can also be seen as a metaphor for alchemical change”…and, “The mixture of stars and hydrogen cloud is a union of opposites.” Seemingly inconsequential, this is actually quite staggering to me, as the nature of the times we are living in is about our own Alchemical Change and Uniting Duality! I also now know that this nebula is a Stellar Nursery, a cluster of recently born stars! (how cool is that?!) Space and time permitting, this is just scratching the surface of the information this nebula holds for me. I am excited to explore this further to derive the information and messages that I sent myself from the future, to my past, to inform my present! Art is an act of creation. By exploring your own art for hidden meaning, revealed through the colors, shapes and symbolic interpretation of the objects used, you get powerful information. It activity is a Sacred Art. I am exceptionally good at facilitating your own personal discovery through symbolic interpretation, whether it be of artwork, dreams or unusual life experiences. Life is meant to be a JOYFUL JOURNEY! Let’s GET INUIT and reveal your own Stellar Nursery NOW! To actualize reaping the rewards of Expansive Love and Joyfully Fulfilling Co-Creation, schedule your personal or group session by calling Intuition Matters at (928) 275-4143.